USS LCS 102 is the last survivor of the 130 LCS vessels built for the U.S. Navy. She was initially designed for close-in fire support during amphibious landings. 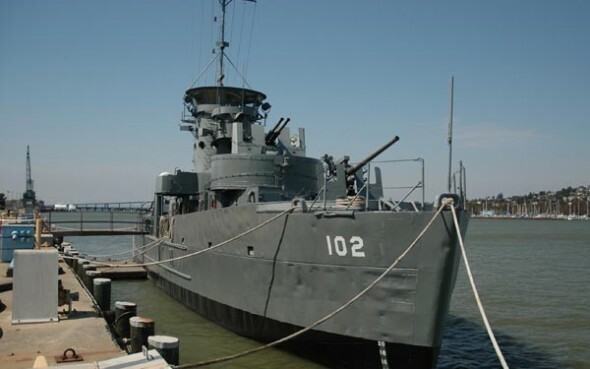 The Landing Craft, Support (later reclassified Landing Ship, Support) class of amphibious warfare ships were used by the United States Navy in World War II in the Pacific. They were primarily used for close support before landing forces on beaches. They also performed radar picket duty and fire fighting. They were nicknamed the “Mighty Midgets”. The original designation for the ships was LCS(L)(3), which stood for “Landing Craft Support (Large) Mark 3”. In 1949 the class was reclassified to “Landing Ship Support, Large” (LSSL). The USN had to have the designation LCS(L) because there was also a smaller class named LCL, that were built mainly for rescue and smoke laying during amphibious operation. At the end of the war, surviving ships returned to the United States. Some were restored to action for the Korean War. Many were transferred to Japan, France, Vietnam, Cambodia, Thailand, Greece, and other nations. Only two ships are known to still exist. One has been highly modified for use as a fishing boat, and the second was still in use in the Thai Navy as the HTMS Nakha, and was fortunately kept in very similar configuration to the original, the USS LCS(L)102. The National Association of USS LCS(L) was successful in having the HTMS Nakha transferred to the Association for public display in the United States. She was officially released from the Thai Navy on November 10, 2007 after being returned to the US in September of that year.